Denver, CO – The Latino Community Foundation of Colorado (LCFC), having operated as an initiative of Rose Community Foundation for 11 years, today officially launched its beginning as an independent 501(c)(3) organization. One of only a few Latino community foundations in the country, LCFC is already a key player in the philanthropic sector of Colorado, having invested nearly $6 million in the Colorado community and supported over 100 organizations statewide. In 2007, the Latino Community Foundation of Colorado was launched by Rose Community Foundation in partnership with Hispanics in Philanthropy, The Jay and Rose Philips Family Foundation of Colorado, Western Union Foundation, and individual Latino leaders, to be a resource in the community and a catalyst for positive change. Today, the LCFC operates as an Intermediary Philanthropic Organization (IPO), bridging the gap between foundations, businesses, and individuals in service of the Colorado community of Latinos. LCFC makes annual community investments of about $1 million with diversified local and national investors with multi-year commitments. Its team currently includes staff, consultants, community organizers, fellows, and interns for a total team of 20 with plans for continued growth as a strong voice in the Latino community. Though Latino communities are traditionally generous, Latinos have been underestimated as philanthropic contributors. The LCFC has increased the visibility of Latino philanthropy in Colorado by creating a pool of donors who contribute funds to help nonprofits build their capacity to deliver high-quality services to the Latino community. The work of the LCFC encourages new leadership, innovation and community-building opportunities of individual Latino donors to benefit communities throughout Colorado. 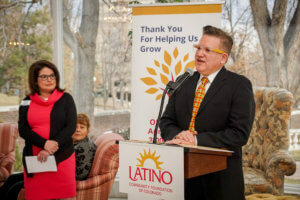 The Latino Community Foundation of Colorado oversees giving through the Colorado Immigrant Funders Collaborative (CIFC), which has distributed over $750,000 to immigrant-serving organizations, as well as Latina and Millennial driven giving circles that reshape the faces of philanthropy in Colorado. Additional programmatic emphases for LCFC include Latinas LEAD, working to build a strong, vibrant Latina community through grants, leadership events, and fellowships; Latino Community Wellness, serving rural mental and behavioral health initiatives for immigrants; Latino Age Wave Colorado, a place-based program serving older adults in the Montbello region of Denver; and annual statewide forums that bring together local communities and national Latino leaders. Rose Community Foundation strives to enhance the quality of life of the Greater Denver community through leadership, grantmaking and donor engagement – stewarding philanthropic resources and investing in strategic and innovative solutions to enduring challenges and emerging issues. Since its founding in 1995, the Foundation has granted more than $287 million to organizations and initiatives focused on Aging, Child and Family Development, Education, Health and Jewish Life in seven-county Greater Denver—recently adding a cross-programmatic community action overlay of support for nonprofit organizations serving immigrants, refugees and communities vulnerable to discrimination and hate crimes. To learn more, please visit rcfdenver.org.